On this date 18 years ago, there was a wedding. Mine! It was terribly hot, over 100 degrees, with 100% humidity. 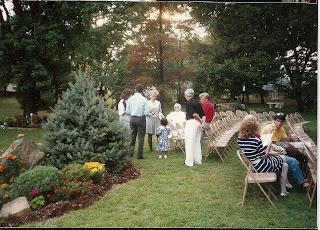 Even in that miserable heat, nearly 400 people came to see us exchange our vows on the lawn of Lawrence and Norma Rich, Steve’s uncle and aunt. Even in those extreme conditions, nothing wilted, not the flowers, not the cake, and not one single guest. The marriage has managed not to wilt either, and for that, I am thankful. Every lawn in Shawneetown was scorched. Blocks and block of homes had wilted, brown, crunchy grass. And dust……except for Uncle Lawrence and Aunt Norma’s. My Aunt Norma could NEVER have stood for a brown lawn. She was a woman of class and grace and influence. 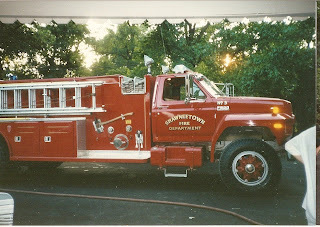 In a small town, if you need your lawn watered, and you have the right connections, you just call the fire department. 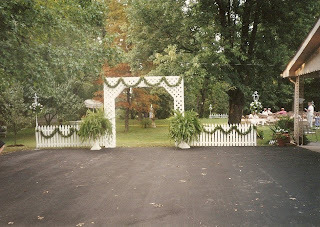 Under Normas watchful eye, the fire department watered her lawn for a month leading up to the wedding. It was a sight to behold…. We worked on that lawn for hours, and did all kinds of landscaping. We watered and planted and prayed everything would make it. And all the plantings did well, except for one evergreen tree. He began to show stress of the summer and was turning brown before our very eyes. He was too big to replace, and we hated to yank him out of the landscaping, so we did what any self respecting florists would have done; we got our the Design Master and painted him in lovely shades of green. He was dead and crisp, but the Design Master saved the day! I think he looks pretty good! Nobody ever knew~check him out in the picture below. And my bridesmaids were at my side. I wanted a nautical/preppy themed wedding. It was the early 90’s. Navy blue linen and yellow. 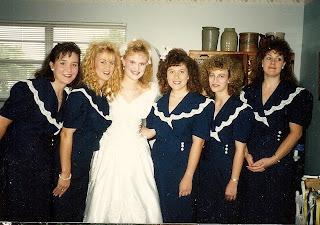 I loved my bridesmaids dresses. I still love my bridesmaids, too. The only reason I did not get it was because my mother HATED it, and would not pay for it. Since my gown was the only thing they paid for, I let her pick my dress. Portrait necklines were in. So was shiny satin and beads and pearls…..yuck! I really should get over it…its been 18 years after all! Even though the dress was wrong, wrong wrong, at least I got the groom right! And as for my enormous wedding party….I love ’em all. Colonial bouquets were all the rage in the early 90’s, as were mini carnations, so what was a florist to do? Lace collar and long ribbon streamers with #3 satin, with knots, very “on trend”, before we knew what is was to be “on trend” My bouquet was all white phalenopsis orchids, in a cascade. My bouquet is classic and timelesss. My bridesmaids bouquets? Not so much….my mistake! So, there you have it. My wedding, 18 years ago. The fashion and flowers, have not withstood the trends and the test of time. The lattace, the fashion, the whole look is tired and dated. But the love, the relationship, the commitment, the affection that Steve and I have is not given to whims of what is ” in “or “out”. It can stand for many more decades. Trends come and go. Commitment outlasts movements and fads. It’s timeless, growing, solid and will never go out of style. Unlike colonial style nosegays with lots of ribbon streamers, we are here to stay and ready to stand the test of time. And one of these years, we will renew our vows. I WILL wear some incarnation of silk dupioni. And I will have the same groom. And I will not have tacky flowers. Happy 18th Anniversary to both of you! Hi Jodi–Thanks for sharing your wedding memories with us. Love your blog too! Copyright @ 20015 - 2016 Wordpress Themes by ZooTemplate. All rights reserved.